Pembroke Hall on Meeting Street in Providence, around 1906. Image courtesy of the Library of Congress, Detroit Publishing Company Collection. Pembroke Hall was the first permanent building for Pembroke College, which had been established in 1891 as Brown University’s college for women. This building was completed in 1897, and was the college’s only building for the next ten years. As the school expanded, though, Pembroke Hall became exclusively used for academics, with a library on the top floor. In 1971, Pembroke College merged with Brown University, and the building was renovated again, to house administrative offices. A third major renovation came in 2008, when the interior was rebuilt with classrooms, conference rooms, and office space for the Cogut Center for the Humanities and for the Pembroke Center for Teaching and Research on Women. Through it all, though, the nearly 120 year old building’s exterior has remained completely unchanged, aside from the missing weathervanes atop the dormers. The Union Trust Company Building, at the corner of Westminster and Dorrance Streets in Providence, around 1906. Image courtesy of the Library of Congress, Detroit Publishing Company Collection. The Union Trust Company was a Providence-based bank that dated back to 1851, when it was founded as the Bank of America. 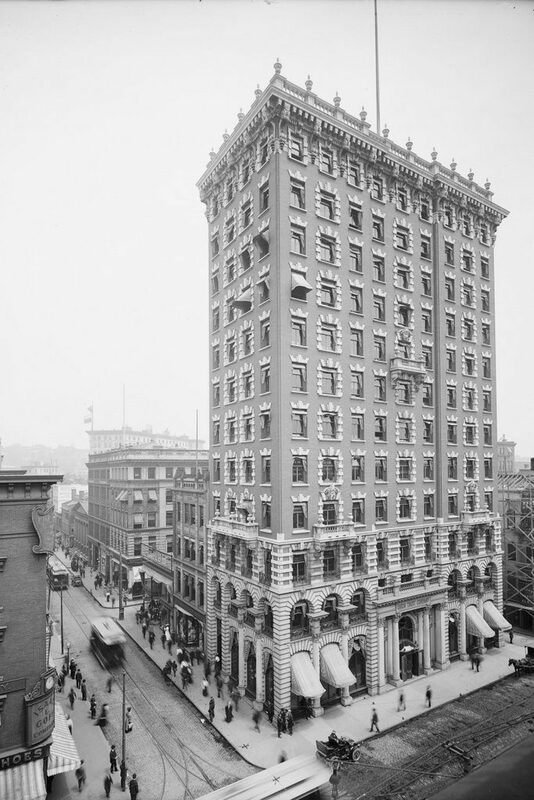 Unrelated to the present-day bank of the same name, it was renamed the Union Trust Company in 1894, and a new corporate headquarters was soon in the works. 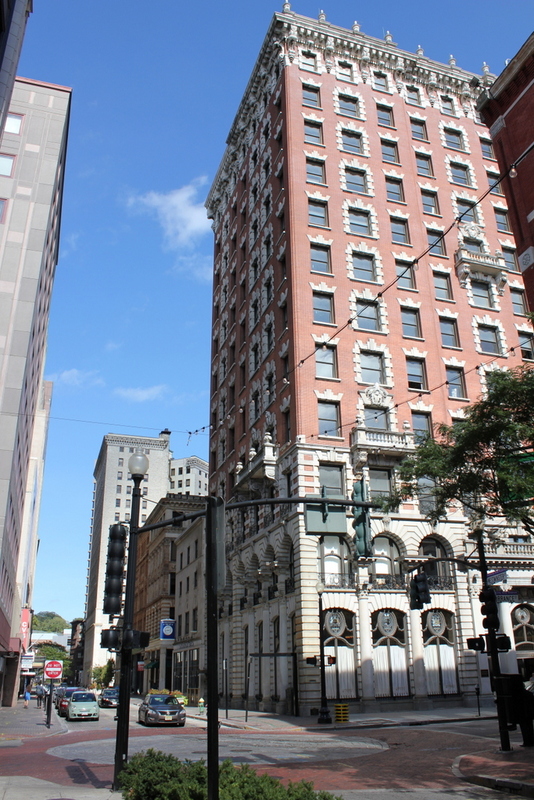 Reflecting both the prominence of the bank, as well as the aspirations of the rapidly-growing city of Providence, the elegant 12-story skyscraper was completed in 1902. The most significant change to the building came in 1920, when it was expanded along the Westminster Street side, nearly doubling its depth. Otherwise, its exterior has seen few changes. As for the Union Trust Company, it remained here until it was merged into the Industrial National Bank in 1957. In the years that followed, the ground floor continued to be used as a branch office for the bank, but today this elegant bank area is now a restaurant, The Dorrance. The rest of the building was used as offices for many years, but the upper floors of the historic building are now in the process of being converted into apartments. 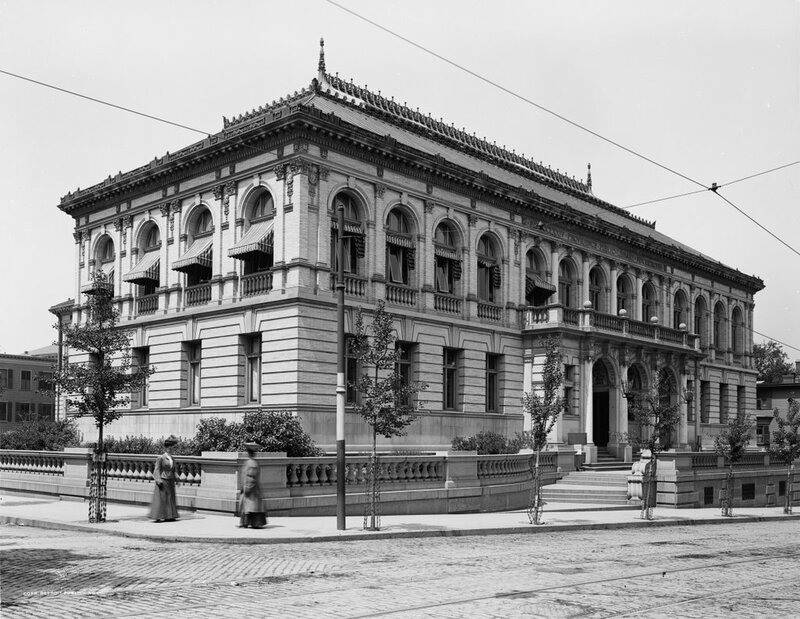 The Providence Public Library on Washington Street, around 1906. Image courtesy of the Library of Congress, Detroit Publishing Company Collection. 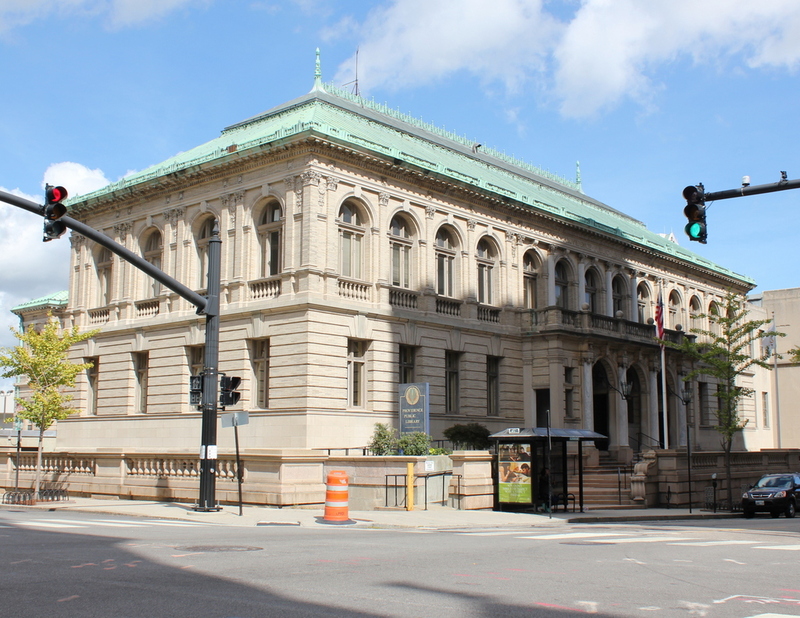 The Providence Public Library was established in 1875 and first opened in 1878, in the second floor of the Butler Exchange building at Exchange Plaza. 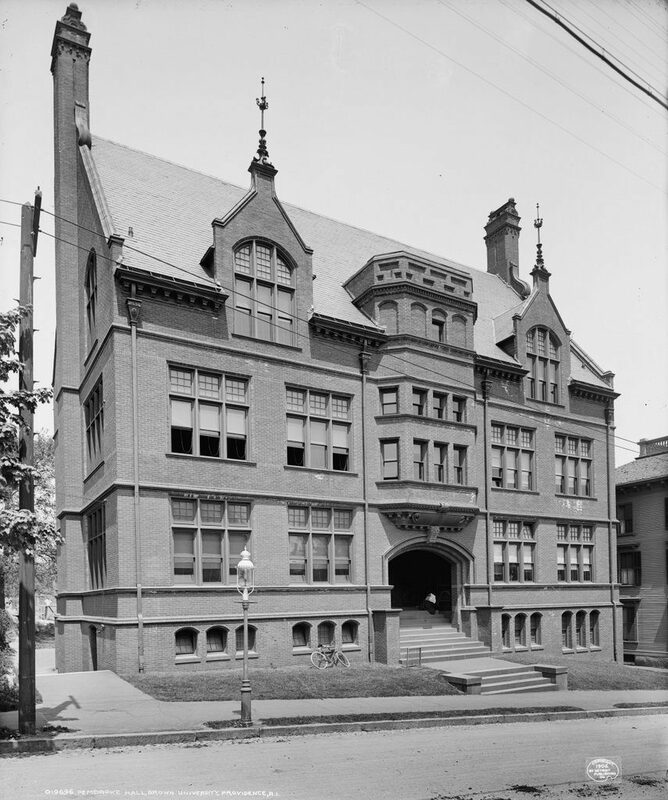 Not until 1900 did the library have its own permanent home, when this building opened at the corner of Washington and Greene Streets. It was designed by the Providence firm of Stone, Carpenter & Willson, and its architecture reflects the Renaissance Revival design that was popular for turn-of-the-century libraries. The style had been pioneered in Boston less than a decade earlier, and would be imitated in other New England cities, including here in Providence and in Springfield. Most of the construction costs were funded by John Nicholas Brown I, who died the same year that the building was completed. The most significant change to the building’s exterior appearance came in 1954, with the completion of a large wing on the Empire Street side of the library. This addition is only partially visible on the far right side of the photo, but its modern architecture is a sharp contrast t the classical design of the original structure. Otherwise, though, the historic library looks essentially the same as it did 110 years earlier, and it is still used as the main branch of the city’s public library system. The view looking across City Hall Park toward Union Station in Providence, around 1906. Image courtesy of the Library of Congress, Detroit Publishing Company Collection. Both the park and the railroad station were relatively new features in downtown Providence when the first photo was taken. They were a part of the larger redevelopment plan of the late 19th century, which included the filling of the Cove basin and the construction of the new State House on Smith Hill. City Hall Park, located on the north side of Exchange Place, was dedicated in 1892 and landscaped in 1898, the same year that Union Station opened on the far side. 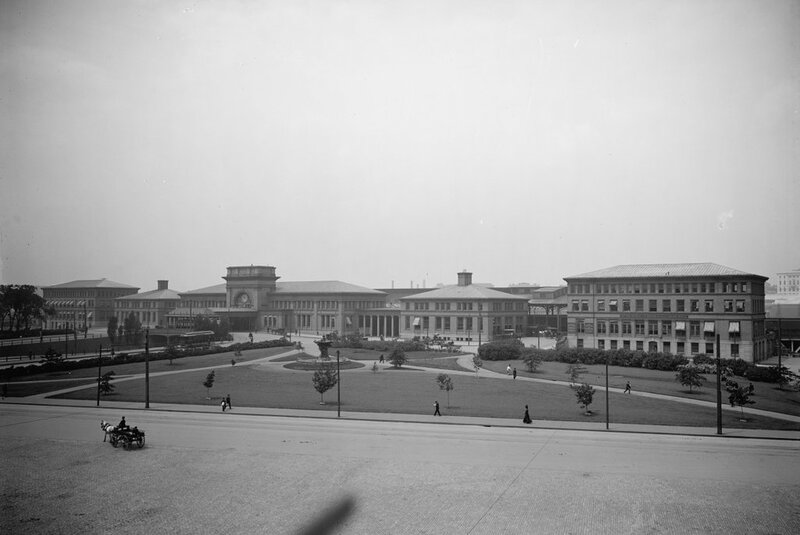 The station complex, as seen in the first photo, consisted of five buildings, and replaced an earlier station that had been damaged in an 1896 fire. Together with the new park and the nearby State House, the station provided a grand entrance for visitors to Providence. At a time when most inter-city travel was by rail, the railroad station was the first part of the city that most travelers saw. 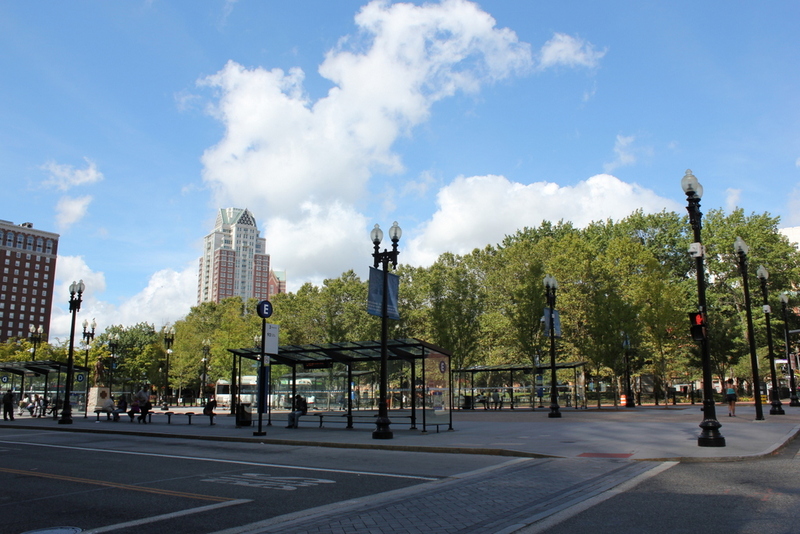 A good first impression was important, and with this new development, Providence had a station that was worthy of its status as an prominent, growing city. As with other grand urban passenger stations of the late 19th and early 20th centuries, though, the Union Station saw a period of decline by the 1950s. The easternmost building, seen on the far right of the first photo, burned down in 1941, and in the postwar era there was a sharp drop in rail travel with the advent of commercial airlines and interstate highways. The building was badly neglected, and in 1986 it was rendered entirely obsolete. That year, the elevated tracks adjacent to the station were removed, and the railroad was rerouted a little further to the north. A new, smaller station opened just south of the State House, and the old station was left isolated, several blocks away from the tracks. The following year, it was badly damaged in a fire, but it was ultimately repaired. Even the destroyed easternmost building has since been rebuilt, and today the buildings have been restored and repurposed. From this view, the buildings are no longer visible because of the tall trees on the park, which is now known as Burnside Park. However, they are still there on the other side of the park, and they are listed on the National Register of Historic Places. 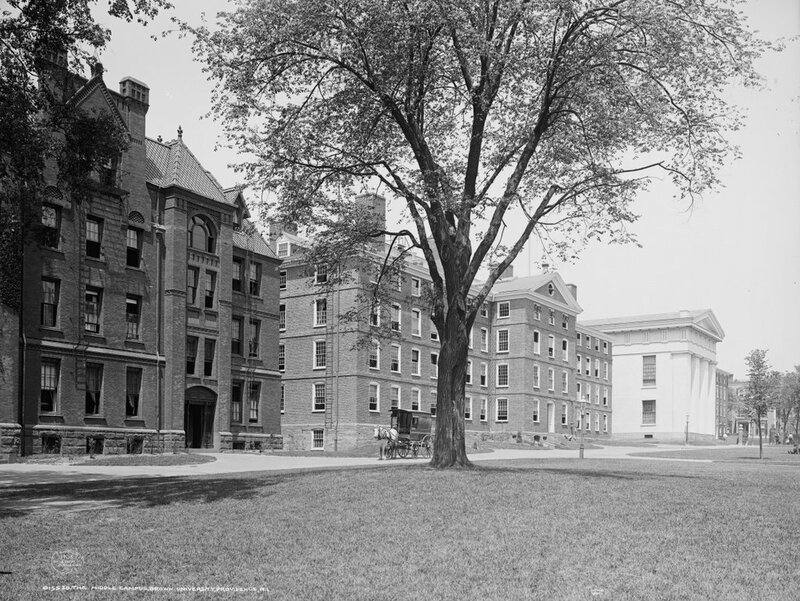 The College Green at Brown University, around 1906. Image courtesy of the Library of Congress, Detroit Publishing Company Collection. 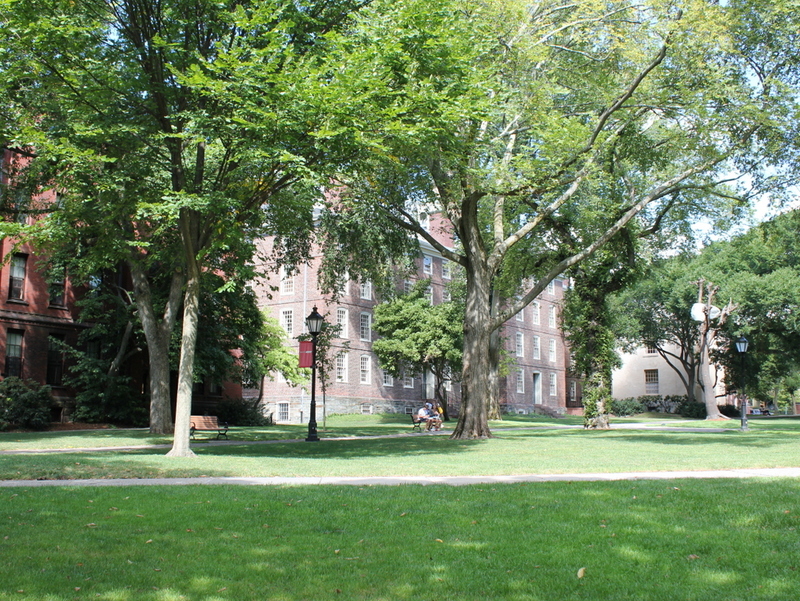 Brown University is one of the oldest colleges in the United States, and one of the nine that date back to the colonial era. It was established in 1764 as Rhode Island College (or, in its original charter, the slightly wordier name of “the College or University in the English Colony of Rhode Island and Providence Plantations, in New England, in America”). Originally, it was located in the town of Warren, but in 1770 the school moved to its current campus in Providence. The first building at the new campus is the one in the center of the photo. Known today as University Hall, it opened in 1770, and has served a variety of roles over the years. During the American Revolution, it even housed soldiers prior to the departure for Yorktown near the end of the war. 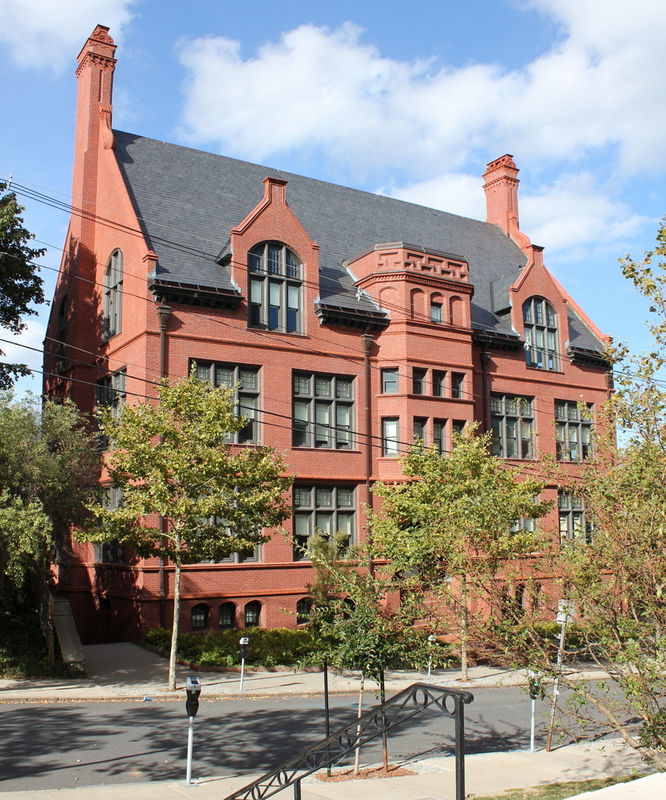 Today, it is used for administrative offices, including the offices of Brown’s president. On the right side of the photo is the Greek Revival-style Manning Hall, which is another one of the older buildings on the campus. It was completed in 1834 as a library and chapel, and over the years its uses expanded to include a museum, studio, and lecture space. Today, it includes the Haffenreffer Museum of Anthropology as well as the Manning Chapel. The newest building in this scene is Slater Hall, on the far left. It was built in 1879, making it more than a century newer than its colonial neighbor. It is named for its benefactor, Horatio Nelson Slater, and was designed as a dormitory by the Providence architectural firm of Stone & Carpenter. Today, it remains in use as a dormitory, and like the other two buildings in this scene, very little has changed in its exterior appearance.